The correct name is EBHOIKIMI from the original name ORIKIMI Orikimi was founded, according to some elders, by one of the immigrant from Benin, who came followed by two of his junior brothers. His name was Ikimi, and his brothers were OSA and ATO, in that order of seniority. Osa and Ikimi were maternal brothers. Others say that Orikimi was found, by a Benin leader called Alaan. From this Prince descended one of the ear Enijie, called OSOAH. He had three sons - AGAAH, who later succeed his father, OSA the second and the third, being ATO, a hunter who fought the bush irresistible and so settled in a place full of big games. E settlement became Ewatto. The second son headed a group of warriors keep on the Benin Road as guards. They founded Ewossa. Some people ftc Orikimi went to join them as others went to do at Ewatto. Soon the soldiers grew in number and strength and began not or to challenge the authority at home in Orikimi, but to disclaim its national At the end the Onojie of Ewohimi had to yield and created their lead Onojie. He also had to create the leader of Ewatto settlement Onojie. support of this link and the original suzerainty of Orikimi over the settlements of Osa and Ato, we have the custom of the Enijie of Ewossa and Ewatto, to this day, coming to Ewohimi - the mother settlement - for the annual feast of OSOAH - their deified father . I have given the above merely as historical exercise. Ewohimi consists of several large villages and it would be wrong to think that they originated from the same source. It would be more specific to take 1 different components and trace their origin. This place was founded by the members of the Ruling Family which came direct from Ezomo's UZEBU in Benin. The founders were member of the disciplined body of men who rebelled against Ewuare's selfish and despotic decrees, seeking freedom and happiness in the jungles of Esanland. The leader of the party that founded the first central settlement was a warrior called IKIMI. His first son was the brave and Popu ALAAN, who honoured Oba Ewuare's invitation when he won over his rebellious subjects in a way that has become famous for its subtlety. Thus Alaan who had become the settlement's leader since the demise of his father, became the first Onojie of Ikimi's settlement which had been recognised by its name of ORIKIMI becoming the overall name of the whole group of habitations. Alaan, on his death, was succeeded by his heir OSOAH who himself had three famous sons. The senior and heir was AGAAH. The second was OSA who had the same mother as Agaah, and the third was ATO. Ato, like the lover of the sport of hunting he was, felt more at home further in the jungle where he could pursue his avid interest without interference. His camp grew into EBHOATO. Osa headed a group of warriors stationed on the Benin - Eka approaches to the main settlement of Orikimi as guards. Other immigrants from home and elsewhere went to join them and the settlement became Ebhosa. About 1550, during the reign of Osawe, they began to think of their settlements as separate entities; their demand for freedom became so great that the Onojie of Ewohimi had to install their respective leaders, Onojie of their people. Thus for a long time after their towns had grown in size and importance, the rulers of Ebhosa and Ebhoato came to Ewohimi for their installation. But with the arrival of the white men who broke up the autocracy of the Enijie by decentralizing their powers, the complete independence of Ebhosa and Ebhoato became a question of time. Although Uselu is really not Okaigben because its founder had lived in Okaigben, the two communities do things in common. The majority of the founders of Okaigben, headed by war leader EZENOMON, came from Uzebu in Benin, while the founders IDUMUABOGHO came from Agbor. Idinro (597) was founded by Ogbe who was the father of Ohen. As a result of the tyranny of the Onojie they had come to join and the severe reprisal they took against him, a large body of the early settlers left and became founders of other settlements in Uromi (Arnedeokhian, Utako and Efandion) and Emu (Ugholo). (I) IKHEKHE (549) whose founder came from Ebhoato but the IDUMU-ONIHA area where the Oniha lives was the aboriginal settlement of Owu which was already in existence even before the founding of Ebhoato: The founders of Idumu-Oniha were already living, but in abject primitiveness, before any other habitation in Owu; the natives describe secluded aboriginals as descending from the sky or from trees! They invariably turn out to be fugitives or immigrants who left Benin or some already existence settlements around, in inconsequential numbers. (2) IDUMU-AGBOR (315): The founders came from Agbor. (3) IZUMEN was founded by EZUAGBO of Egoro, in Ekpom district. Ezuagbo was an insatiable hunter who with his dogs chased a grass cutter across a third of Esan jungle. He however, got tired before the grass cutter, and he decided to rest his acheing and bleeding limbs a-while (ZUMEN KHERE! ), before proceeding with the chase. 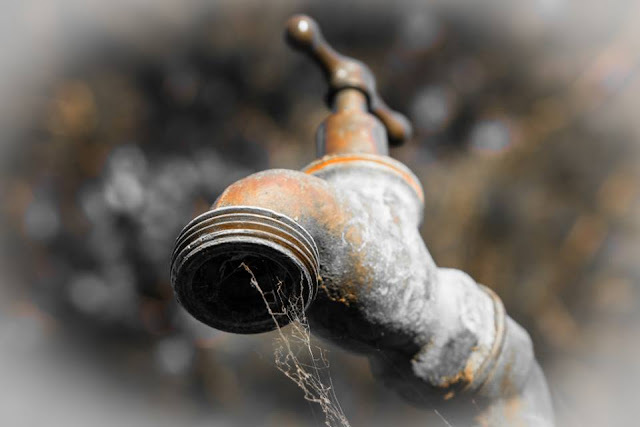 As he rested he forgot" all about the grass cutter which no doubt was nursing its jar: renew nerves and bones in a thicket nearby; seeing smoke, Ezuagbo decided to trace its origin, and so came upon a lonely settlement presided over by man called EZEGHUMAGU. In surprise Ezeghumagu asked Ezuagbo where he came from and he told him he was a hunter on the kill of a fleet-footed rodent which he was bent on pursuing after a much needed rest. He would return to his home Egoro when he had got the animal in his bag. "Come and rest a-while", urged Ezeghumagu, who, producing the long pip enact peace and friendship, usually passed from mouth to mouth as a sign, oneness, soon made the hunter so much at home that for days he forgot about his dogs -not to talk of the lucky grass-cutter! But the irresistible yearning of the hunter soon returned and he took his AKPEDE (Cross-bow), collected his arrows ready to go, but the landlord was too crafty to let this man leave him again to his loneliness; he invited him to marry his daughter hoping that might make him stay. The hunter took one longing look at the beautiful damsel and became engrossed with the thought of getting a wife in place of a grass-eating animal! Ezeghumagu soon began to have fear in his mind that the hunter might one day run away with his daughter to his home in Egoro, so he placed guards round him. On the Igueben road he placed a body of men headed by ASABA. On the Ebelle road, IKHEKHE, one of his subordinates who hailed from Ebhoato. The house of the hunter and his wife was thus situated centrally. Now Ezeghumagu who was found in the area was the founder of the aboriginal settlement of IDUMU-ONIHA. The Ebhoato man guarding Ezuagbo on the Ebelle side, founded Ikhekhe. Asaba guarding the hunter on the Igueben side, founded IDUMU-ASABA. The hunter and his descendants founded IZUMEN - now hemmed in on all sides. A majority of the founders came from EGBAIN in Benin while others came from Egoro. This place was founded by an erring Prince from Ewohimi. He was IBHIGBODE, son of Onojie AMESE, and was related maternally to Okhirare of Ohordua. The banished Prince left Eguare with his family but was consoled with the title of EDOGUN. (6) lKEKEN was an overflow from Eguare; lkeken, Agadaga and Okede form EBHONEA. The traditional home of the Iyasele in Ewohimi is Ikeken. Orikimi, later corrupted to EBHOIKIMl, was for a long time isolated from the rest of ISHAN 'A'. In fact until 1920 when the all-powerful Ishan Enijie Council was formed, it had very little in common with the already well known Esan towns like Ekpoma, Irrua, Ewu, Uromi, Ugboha and Ubiaja. This was because when the Oba had political and even spiritual control over Esanland, the Enijie in Esan paid their homage by two different routes. Ishan 'A' - Ekpoma, Irrua, Ewu, Uromi, Ugboha and Ubiaja paid theirs through the Ojirrua who directed the proceeds to the Oba via UHONMODE, that is, the Eho way. Enijie of Ishan 'B' - Ewohimi, Emu, Ohordua, Ewatto, Ewossa, Ekpon, Ebelle, Ogwa, Ugun, Ujiogba, Okalo and Igueben paid through the Onojie of Ewohimi, who directed same through Igbanke - Agbor route to the Oba, through the Ezomo. This was the reason for the fact that though no Onojie in Ishan 'A' disputed the Okaijesan title with the Ojirrua, the Onojie of Ewohimi had always been at pains to limit the title. The Honourable Samuel Usifo Onosegbe II the Onojie of Ewohimi. He is educated and joined the army in 1942. Between that year and 1947 when the World War was at its fiercest, he served overseas. On the death of his father, he was installed Onojie on the 18th of April, 1949, at the age of 28. Onosegbe II is a mature, fearless, sharp witted and fluent Ruler. He is full of zeal, has a knack of being firm without courting charges of autocracy. He has spared no pains in attempts to open up Ewohimi which even as the old administrative headquarters of Ishan 'B' and the origins Native Court Centre since 1918 for Ebelle, Ekpon, Ewossa, Amahor Ogwa, Okalo, Ugun, Ujiogba and Ewatto, was a town with jungle extending to the compounds. Under Onosegbe II the trees have been cut down, with the streets right from Agadaga to Eguare, full of bright sunshine and healthy fresh air. He brought a worthy glory to Ewohimi by his success at the general election of 1951, which made him an honourable member of the Wester House of Chiefs, and a member of the Western Joint Council. After creation of the Midwest Region in August, 1963, he became a member of the Midwest House of Chiefs in 1964 and a Minister without Portfolio, under the first Military Coup d'etat on January, 15, 1966. He served in the Premier's Office. In 1993 the Onojie of Ewohimi at 72 - is still agile responsive, always with a twinkle in his eyes. There are two Palace Societies connected with the selection appointment and installation of the Onojie in Ewohimi. They are the IWEEKA and the IWEGUAE. Both draw their membership from ex-Palace steward and some hereditary Chiefs, all sworn to oath of allegiance to the Onojie. They may be recruited from Eguare and the villages. The Iweguae form the servants of the Household and no secrets of the Palace are witheld from them. They are responsible for the everyday dress of the Onojie and for the discipline and proper conduct of the Onojie. The Iwebo are responsible for the ceremonial dress and this society is headed by the Osukhure, who is appointed not by his age but by selection of the elders of Eguare. Traditionally he must come from a part of Eguare which since 1900, must be euphemistically described as a PARTICULAR QUARTER of Eguare. 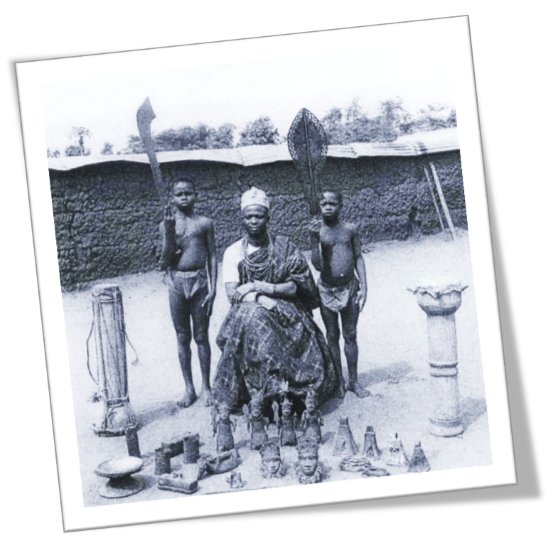 The Iweaguae who are nearest to the person of the Onojie, know the in and out of the Palace, know the children and their ranks best and so have the responsibility of selecting the right heir should there be any dispute over seniority. Ewohimi works on the assumption that the throne is never vacant, expressed locally as OKPEKPE lSI or OJIE IFO BHE EGUARE, but with the strict understanding that should the man so hastily installed in an attempt to uphold this myth, die without completion of the vital burial ceremonies, be would forfeit the right of inheritance of both the family property and title, for his children. Thus as soon as the Onojie dies, the Iweguae dress the heir and presents him to the Iwebo saying, "Look at our son we want you to make him a man". For an answer, the Iwebo take him to the bed where the Onojie Has died , strip the dead Onojie of the cloth he was wearing, his headgear and walking stick all of which are handed over to the person to be made Man. The Osukhure assumes control of the installation ceremonies. Facing the heir he asks, "Who are you?" The heir answers, "I am this dead man's son and heir". This answer is followed with a long pause with the Osukhure looking round the gathering, waiting for any challenge. If someone challenges this assertion the Iweguae are sent back for the selection of the right son and heir. But if after a pause of almost ten minutes which gives the proceedings a dignified air, no challenge is forthcoming, he proceeds with the ceremonies. Facing the undisputed heir the Osukhure reminds him of the grave responsibilities which have fallen on his shoulders as a result of his position ; he reminds him of the onerous duties of the Onojie title, and then he calls the heir by name, intoning in a grave way, "Remember from this day that you have a boundary with the king of such and such a place on such and such a road", thus demarcating his territory, before the wise man continues , "Within this boundary, all is yours; above you now know, man animals, birds of the air, trees, roots below the ground are all gifts from God above us all for you. The land is yours because your fathers defends it against all Kings. Do not let it shrink in your time, on the contrary history will remember you if you add to its size; no dishonest decisions respect the elders who created me today, in turn creating you no" Remember God hates stealing and if God hates you, he hates our land". With these admonitions complete he counts him on the innermost Ojukhuo, making him take his seat on the eleventh count. He now steer back and looking at those present he asks, "Has anybody anything to say? And from the audience consisting of members of the Iweguae, Iwebo and the Princes, someone addresses the man on the throne anyhow -the last insulation of his life! The Osukhure then takes the official Ivie (Royal Coral Bead Necklace) the father used to wear and places it round his neck, saying as he does so "with this shall you be known as the Ruler of our people!" He then steps back, raises his clenched first holding the right elbow with the left hand, to give the traditional salute of DO QMQN! UKHA LE OJIE U RNAN QMQN! (Hail our Lord! May you be succeeded by your son!) The members of the two palace societies come forward to pay their homage to the new monarch. As explained already all these ceremonies are just to fulfil the custom of the throne being always occupied, for the man now in the Palace is yet not an Onojie legally and in essence he is a mere caretaker. For instance he is forbidden any outing for the next three months when I should be neck-deep in the vital ceremonies which give him lawful hold of the title. The administration of the town is carried on during this time by the Onojie's next in command, the Oniha, with the Ihaza acting in local matter in Eguare. Yet another support of the fact that he is yet not an Onojie is the strict custom that up till now the death of the last Onojie has not be announced, and so far as the public knows, the late Onojie is still on the throne. At the end of the third month the Oniha comes in the night accompanied by the newly installed man who carries a lamp. They enter the chamber and at each door they stop for the Oniha to shout, "Where is our son?" The woman opens the door and hands over twenty-one cowries which the Oniha’s attendant bags! When they have gone round the harem wither seeing the late Onojie in body or in spirit, the Chief shouts, "O! My son is lost!" - A signal for the women to cry and mourn the death of their husband who had been buried three months ago! The cry in the harem is the first public inkling of the momentous happenings in Odugha. An Onojie is dead! Should anybody cry or try to give away the death of the Onojie before this official crying or announcement of the Oniha, the punishment is customary - the slaughtering of the fattest goat in sight against the alarmist! After this official announcement, the women pay a fine of a goat to the elders of Eguare who rush to the Palace to see what is wrong. The fine is a punishment for their exposure of the secret members of the Iwebo and Iweguae had kept for three months back. The Chief mourner gives two goats to the Oniha. One is slaughtered to declare the harem open to the new lord Supreme of all within, which may mean anything up to 150 women, when an ONOJIE WAS STILL AN ONOJIEI The final reward for the Oniha is a wife. With the death of the late Onojie now announced publicly, the heir for that is what he really is to the public, now begins the all-important ceremonies, the vital parts being over in 7 - 14 days. As explained already it is only of recent - say in the early thirties that Ewohimi began to have a lot in common with the rest of Esan particularly what used to be called ISHAN A' . To the surrounding districts of Emu, Ohordua, Ewatto, Ebelle ,Ekpon, Amahor, Ogwa, Ugun, Ujiogba, Okalo and Ewossa, the Enijie of Ewohimi were well known and through them they paid their yearly homage to the Oba. To correlate the history of the two parts of Esan land, it is Helpful to know the contemporary Enijie. 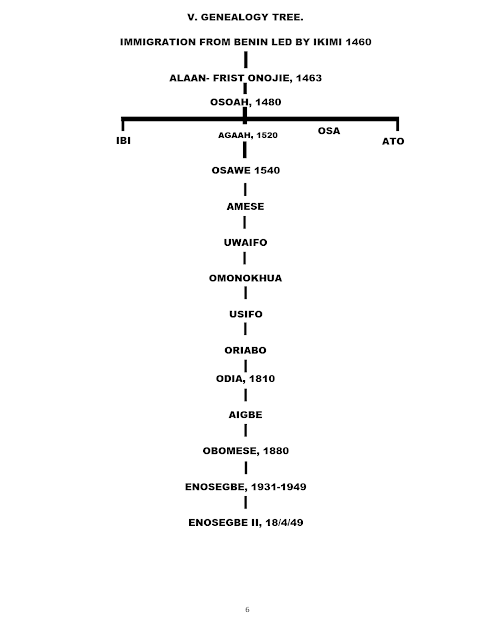 Alaan, the first Onojie of Ewohimi was installed the same time as Ekpereijie of Irrua, Ichesan of Uromi, Oghomighon of Ubiaja, Onor of Ugboha, Uwagbo of Emu etc. While the great Odia was a contemporary of Usifo of Ubiaja, Ediale of Uromi, Okouruwa of Irma etc. Aigbe reigned at the same period as Isidaehomen I of Irrua, Agboga of Ubiaja, Olumese of Ugboha and Akhilomen of Uromi. Ifebho was overlord of Ewohimi while Eromosele the Great was the monarch of Irrua, Ogbidi at Uromi, Okojie at Ugboha and the wise Imadojiemu at Opoji acting as Caretaker for the young Akhimien of Ekpoma. OSAWE, 1540: May be mentioned because he installed the first Enijie of Ewossa and Ebhoato. Osa the elder and more cantakerous was installed about 1545 and Oloon of Ebhoato, taking a cue from the resistance of Ebhosa, was installed about five years later. THE GREAT ODIA: He became the Onijie about 1810 and was a loved and much respected Onojie. It was during his reign that a great personal friendship started between the Oba of Benin and the Onojie of Ewohimi. It arose in this way. Obanosa died in 1816 and soon after his two eldest sons – Eredia -Uwa who was first and Ogbebo the second began to fight for the throne. A civil war broke out and in this Eredia-Uwa lost and knowing that his head would certainly have fallen to make his brother secure on the throne he had won by conquest, fled to Ebhokimi. Despite the bribes of Ogbebo to the Enijie of Esan, Eredia-Uwa's life was ably protected by Odia who gave him refuge. 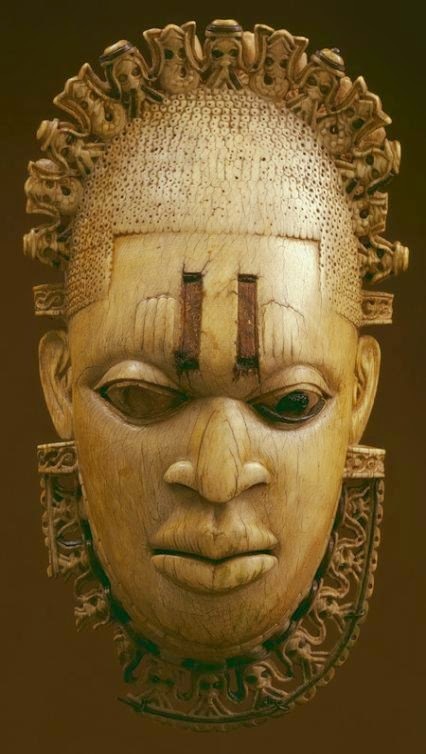 All attempts Ogbebo made through powerful agents were foiled by Odia's over-all protection for the Prince's life. After eight months another civil war broke out at Benin and the usurper, Ogbebo, with defeat and disgrace staring him in the face, destroyed everything in the Palace including himself by hanging. Jubilant messengers were sent to Ebhokimi to invite Eredia-Uwa home. He returned to Benin and was crowned OSEMWEDE in the later part of 1816. The erstwhile fugitive in Ewohimi completely at the mercy of Odia, now became the Oba of Benin, the overlord of Esanland. The good change in his fortune did not make him forget the deep gratitude he owed his protector Odia. His first act of reward was to give Odia and his successor the full right to use the full IDIGBA, the stiff coral bead neckwear, which originally meant to give the wearer a proud and disdainful look, made him look more like a man suffering from Torticollis than a mere victim of Pride! To this day the Onojie of Ewohimi still uses the Idigba on state occasions. Oba Osemwede is said to have given Odia the right to BAA IGBEN, that is, the full power to take any man forcefully as his servant, or any woman as a wife, single or already married. Every Onojie had this power which of course was limited to his own territory where he was lord of all he surveyed. No Oba could have given any Onojie the power to force a woman into his charm from another Onojie's domain. If any Onojie tried that he would have an interclan war in his hands before the Oba heard of his death. 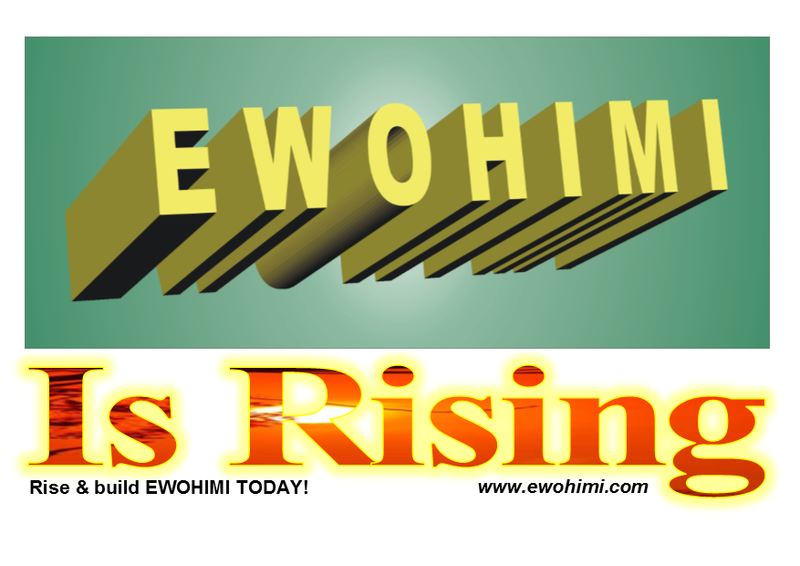 IFEBHO ascended the Ewohimi throne just as the Europeans were coming into Esanland with the result that his greatness was expended in bringing good things to Ewohimi rather than his greatness being measured by the degree of atrocities as of old. Eight years after his ascension in 1908, the AGBOR - UBIAJA Main Road was opened and this went a long way to break the old isolation of this great country district. In 1918 the Ewohim Native Court was established, thus confirming it as the judicial headquarter: of ISHAN "B’. Like Momodu of Irrua, Okojie of Ugboha, Imadojiemun of Opoji, Oribhabo of Ohordua, Ifebho was made a District Head (D.H) for the area in 1920. When the tyrannical Ishan Enijie Council combining executive with judicial powers was founded in 1920, Ifebho of Ewohimi was one of the members shown as above. He died after a long reign of 31 years, at ~ O'clock of the morning of 4th March, 1931, a month after Okojie of Ugboha. The first ruler of Ibi was a partriline relation of Ewohimi. Osoah had the following sons: the most senior was IBI, then Agaah, Osa and Ato Ibi unfortunately messed up with one of his father's wives; Osoah though aged, had continued to collect lovely women in his harem and verily had he been described as the type of woman lover who if he knew the world was coming to an end tomorrow would still be making preparations for a new wife today! Ibi's lapse was therefore unfortunate and Osoah could not demand the usual maximum penalty; he was however banished from Ewohimi and he with this family founded fbi. At Osoah's death, the second son Agaah, performed the burial ceremonies and succeeded his father! Up to today, 1993, there is still heated argument regarding first, whether Osa and Ato are brothers of Ikimi, secondly which of the two Osa or Ato was senior and thirdly who was maternal brother of Ikimi. From the areas, Ewohimi, Ewossa and Ewatto and from the archives I could find no agreement. In the fifties the nearest thing to the truth which the elders gave to me was that OSA WAS SENIOR TO ATO and a maternal brother of Ikimiof Orikimi but in 1986 Ewatto people swore that they were senior and closer to Ewohimi than Ewossa. H.L.M. Butcher in the thirties tried to unravel the truth, got different stories at Ewohimi, Ewossa and Ewatto. He finally went to Benin where he was told Ato was the senior as narrated by Onosegbe I. When I dug into the matter in 1953 my findings were that Osa and Ato were not brothers to the founder of Orikhimi but children, that is they are later arrivals. Ewohimi is thus in a father position to Ewossa and Ewatto. As for seniority the traditional tie between the three places despite politics is still so strong that no junior will attempt to break kolanuts in the presence of a senior. In a gathering of Ewossa and Ewatto, Ewatto has the honour - I gathered that this honour followed the late Joseph Odigie's failure at his second election into the House of Assembly. He traced his catastrophic failure to the people of Ewossa who never voted for him and he, hurt and humiliated, swore he would get his revenge which took the form of his crusade round the area to emphasize that it is against Esan custom for two maternal brothers to choose before a third but junior brother from another DOOR (another wife). Since the order had been Ewohimi, Ewossa, both from same mother and then Ewatto, the correct Ishan custom is Ewohimi, Ewatto and Ewossa and this argument won! This is a forceful argument based on wrong premises. If one looks at the Genealogical Tree of Ewohimi one would see the level of the Princess called Osa and Ewatto. 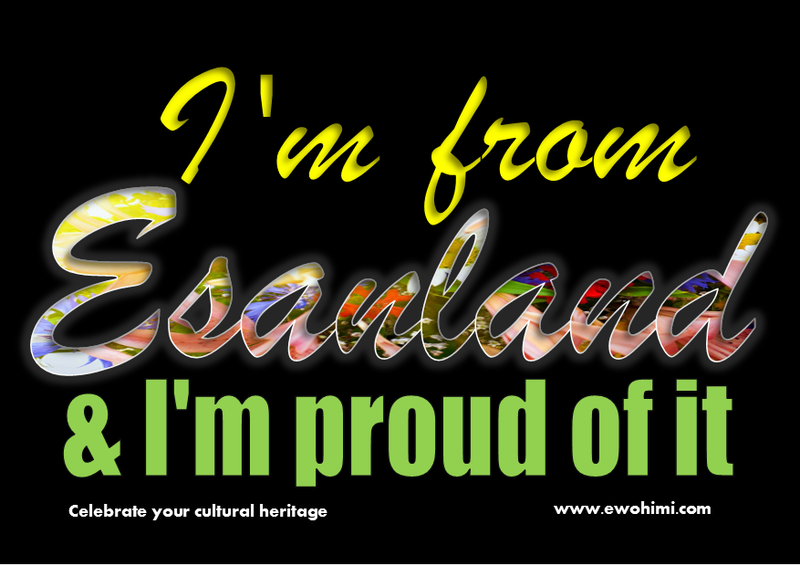 They were no brothers of Ehhokirni but great great grandchildren of Ikimi founder of Orikimi (Ewohimi). The four Princes were - Ibi, Agaah, Osa and Ato, children of 05030, son of Alaan, the first Onojie of Ewohimi. Thus they are children of Ewohimi, NOT BROTHERS. How could they be children from different wives with Ato coming from a different mother when Osa and Ato were not children of Alaan the first Onojie of Ewohimi. Being children of 05030, yes - they could come from different wives of the second Onojie. If indeed the late Joseph Odigie propounded the theory that made Ewatto senior to Ewossa it is based on entirely false premises. In the early fifties our elders were not steeped in politic s that today colour all matters. They still had fear of the departed spirits. Let me illustrate what I am saying. I see a good cheer for those of us who had been advocating for maintenance of our custom. Irrespective of education, religion and posit ion in the community. After nearly a hundred years of arguing whether Osa or Ato was senior, the Ewohimi, Ewossa and Ewatto communities had quietly ignored the arguments and maintained their custom. As already described under cutting of kolanut tree (Chapter Ill) it is seen that no important function takes off in Esan land without asking for the blessings of God and departed ancestors without kolanuts. In a gathering of Ewohimi, Ewossa and Ewatto people Ewohimi breaks the kolanuts, if it is a gathering of Ewossa and Ewatto people only "AN Ewatto man breaks the nuts", Ewatto people told me in 1986. So I went back to the area on 16th of May, 1987. Ewatto elders maintained they were senior and usually break kolanuts but at Ewossa the Onojie H.R.H. Stephen Eidenojie, felt so hurt that he pleaded with me to tarr y a bit and he immediately went for two of the oldest men - Omoijiahio confirmed what I had known since the early fifties when I gathered the materials for ISHAN NATIVE LAWS AND CUSTOM: that Ewossa was the senior of the two brothers and so was NUMBER TWO in the Ewohimi - Ewossa - Ewatto group. NOTE: This history is subject to updates. If any of our reader has information to share with us please do so. Also we need photos of ENOSEGBE II.